Team Moon: How 400,000 People Landed Apollo 11 on the Moon by Catherine Thimmesh. Review: 3,2,1 LIFT OFF!!! Have you heard about Apollo 11 but not known that much information about it, then this book is perfect for you then; it explains how the astronauts and the other 400,000 people managed to get a man to land on the moon. In 1969 three people managed to go to the moon through all the dangers of space with a lot of people on earth helping with the mission, and readers will learn about this experience in .Team Moon by Catherine Thimmesh, a book which is intended for readers in upper elementary and middle school (third grade and up), because of its length . The vocabulary is appropriate for kids of these ages because it has some complicated words Team Moon was written to inform people about Apollo 11 and how everyone involved managed to do it. I think that adults would enjoy it because it has a lot of information, good plot, and good pictures. The illustrations on the pages go perfectly with the text. For example while the reader is learning about lift off thereÕs a picture of the rocket ready for lift off. The astronauts aboard Apollo 11 were very brave and the people at mission control were very dedicated to the cause of getting Buzz, Neil, and Michael on the moon. 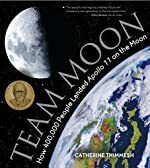 I believe that Catherine Thimmesh put a lot of time, effort, and into writing researching Team Moon because it has a lot of facts, quotes from astronauts and NASA workers, and pictures behind the scenes of the Apollo 11 mission. Review written by Ethan (6th grade student). We would like to thank Houghton Mifflin Harcourt for providing a copy of Team Moon: How 400,000 People Landed Apollo 11 on the Moon for this review. Have you read Team Moon: How 400,000 People Landed Apollo 11 on the Moon? How would you rate it?